The list is endless when it comes to the rituals of Indian wedding. It involves a lot many customs and rituals. Roka, tilak, sangeet, mehendi and haldi; are the major events. Of all these Mehendi is an indispensible and very auspicious custom in Indian culture. It is a core ritual in both Hindu and Muslim weddings. Mehendi designs are being made using the paste of Mehendi leaves which are soaked in water overnight. Application of mehendi is not restricted to just the wedding purposes. Rather it gets involved in almost all the major festivals in India like Diwali, Eid, Karva Chaut, Teej, and many more. On the day of mehendi in the wedding week, mehendi designs are made on the hands and feet of the bride. Special bridal mehendi designs are being put on the bride’s hands and feet. Check some of the top mehendi designs as given below, which have been common with celebrities as well. The big fat wedding of the Indian television actress Divanyka Triparthi happened on July 8, 2016. Ever since her mehendi ceremony happened, a lot has been talked about the designs made on her hands. 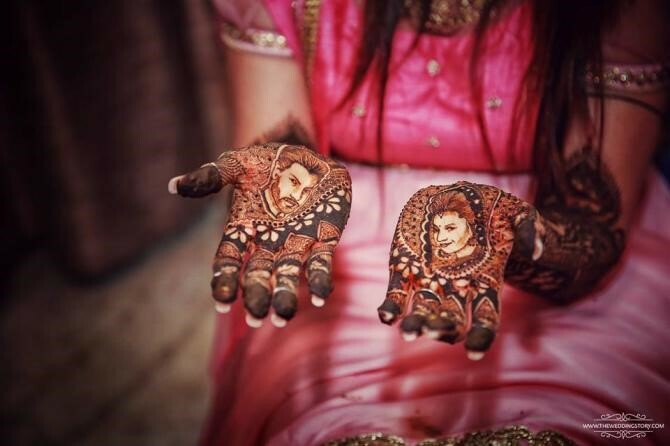 Like never seen before, she had images of her husband Vivek Dahiya and herself made on her palms. The idea is not only creative but also looks fresh. Both images are surrounded with intricate floral designs. Check out the amazing mehendi she had for the special occasion in the pic below. Many of the Indian brides try to get mehendi designs by imitating the Bollywood actresses. So even if you want to have a short and simple design for your wedding mehendi, try out the way Aishwarya Rai Bachchan did for her wedding. It was extremely simple, without much heavy intricacies. Have a closer look at the design in the pic below. If you are wearing a full sleeve suit or blouse on your mehendi, then you will need to restrict your mehendi only till your palms. Check out how the Bollywood actress Sonakshi Sinha does it as shown in the pic below. The design is sharp and intricate, gracing her hands. Bollywood actress Shilpa Shetty got married to a Punjabi business tycoon Raj Kundra, and for her wedding mehendi, she extended the design till her elbows. The Mangalorian girl looked outstanding with the heavily intricate mehendi design on her hands. Check out her mehendi below. In case you are a minimalist and less is more for you, take South Indian bride and Bollywood actress Vidya Balan as your inspiration. For her wedding mehendi she opted for the traditional single mandala design, where a large circle serves as a base around which further patterns are made. It looked cute and simple. Have a look at her bridal mehendi. Bridal mehendi designs are not made just for the sake of dressing up the bride. Mehendi holds a lot of significance, especially when it comes to Indian weddings. It is a commonly believed that darker the colour of the mehendi on the hands on a bride, deeper will be her husband’s and mother-in-law’s love for her. Mehendi is also considered symbolic to fertility. Not only the bride, her friends and other females of the family also put up mehendi designs on their hands. Even the groom is supposed to get a small mehendi design on his hands. 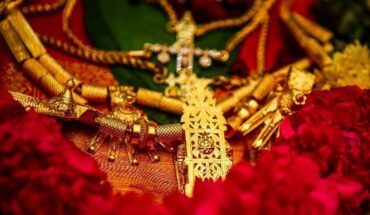 In some regions, there is a small ritual after the wedding where the groom is made to search for his name, which is usually smartly written so as not be readily visible in the mehendi design. Do you have any other design or suggestions in your mind? Tell us more about it in the comments section below.